Planning an Event? Bernick’s Can Help! 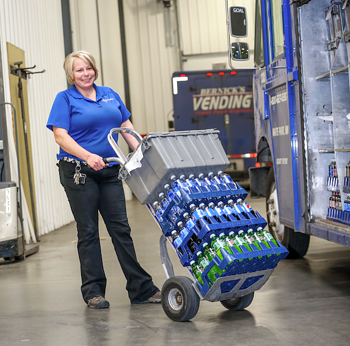 You likely already know that Bernick's is the premier distributor of soft drinks, beer, and vending services in Central and Northern Minnesota, along with Western Wisconsin. But you might not know that Bernick's also offers a wide range of services and supplies designed to make event planning successful! That's right - the Bernick's team can provide you with the products and support you need to execute a fabulous retirement bash, throw a wildly successful customer appreciation BBQ, host an evening of live music, or celebrate the launch of a new business. We have the skills and experience needed to transform your next event from stressful to successful. How? At Bernick's, we believe that events should be fun, not stressful, and that's why we offer one-stop shopping for all those 'little things' that make a big impact at events. We've all been there - running madly around town searching for party supplies, looking for hard to find items, and scrounging in our garage for extra coolers, etc. Enough of that! We have good news; planning an event doesn't have to be a pain. If you're ready to enjoy a hassle-free experience when organizing your next gathering, your first call should be to Bernick's. Bernick's event services include access to our full line of both alcoholic and non-alcoholic beverages such as soft drinks from Pepsi, domestic beers from Miller, and even Starbucks coffee products. Our sales team can offer special event pricing, and we'll work with your budget to design a drink menu that fits your specific needs. In addition to our renowned beverage supply services, we can supply napkins, disposable cups, snacks, signage, and more, saving you the cost and time spent running all over town to pick up your must-have supplies. And our event planning services go beyond offering the supplies; our experts are available to help you every step of the way, whether you need assistance with sourcing marketing materials, timing your beverage orders, or choosing the right products for your guests. Because we don't have pre-set party and event menus, we can customize the drink selection to match the theme of your event. We can even provide everything you need to keep beer and soft drinks icy cold. Bernick's can supply your event with essential equipment like portable bars, ice tubs and bins, and kegerators. Plus, we can advise you on how many beverages to order based on the size and type of event you're planning. Throughout the entire process, you'll have a dedicated Bernick's rep available to support you through every stage of planning an event. Your rep will work with you to ensure a seamless, stress free event planning experience. In addition to our wide range of products, your Bernick's rep can provide you with crowd-pleasing POS materials, custom-made banners, and promotional 'swag', perfect for use as door prizes and giveaways! At Bernick's, we know that every event is special, that's why we custom tailor our event partnership services to meet the needs of each of our clients. When you partner with Bernick's, you'll enjoy one-on-one attention to detail that can only come from a dedicated, experienced team of event planning experts. Whether you're planning a big bash or a small special event, when it comes to finding a strong, supportive, and experienced partner, think Bernick's. To learn more about Bernick's unique event planning services and special event pricing on our products, contact one of our friendly Reps.